Here is the easiest way to go about JAMB registration 2019 and get your JAMB e-PIN fast and easily. If you find yourself right on this post then it means you have created JAMB Profile and need to purchase a UTME/DE PIN (jamb ePin) without breaking a sweat. Have you created a jamb profile? If you haven't, to create a new profile is very simple, kindly follow the jamb official instructions on https://www.jamb.org.ng/emailverify.htm to obtain your unique confirmation code (profile code). After you might have successfully gotten your unique profile code, what next? The next step is to get your jamb ePin which can easily be done using Interswitch quickteller payment gateway. Actually, they are two payment methods for jamb registration (Remita/Quickteller), but here we recommend www.quickteller.com/jamb as it's the easiest way to get jamb ePin. Now all you need to do is follow the easy steps below and your jamb 2019 registration will be done in no time. Send your “First Name - Middle Name - Last Name” to short code “55019”. You’ll receive an SMS acknowledging receipt of your request. You’ll receive your unique process code via SMS. Use the process code (User ID) to get your ePIN on www.quickteller.com/jamb. That’s all! With Interswitch quick teller, Buying JAMB ePIN is now one less thing to worry about. 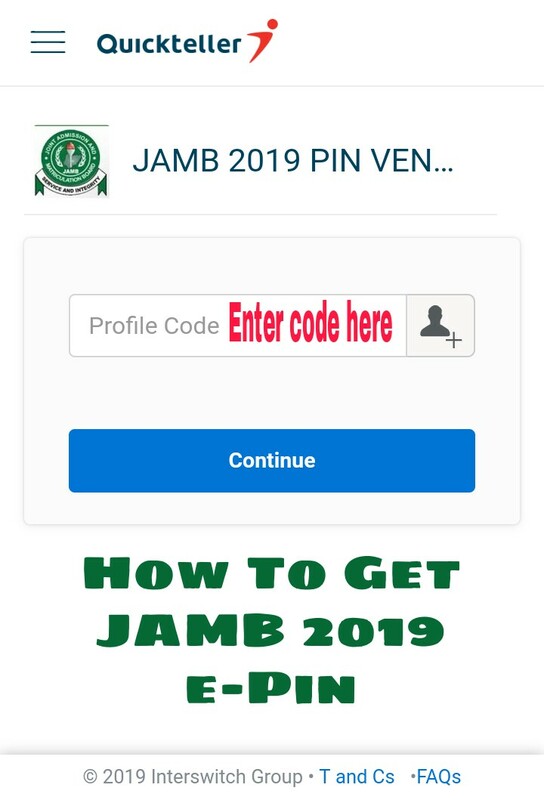 I hope you find piece of information useful as it contains everything you need to know about JAMB e-PIN for 2019 registration and how to purchase a UTME/DE PIN easily. Credit: Jamb registration 2019 by Comfortskillz Blog.